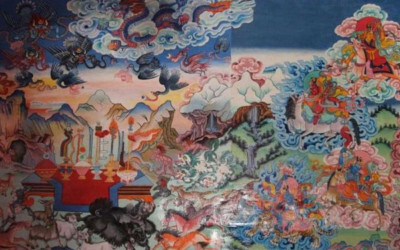 Over the last few months, the Chhairo community has reaffirmed its support for the gompa restoration. 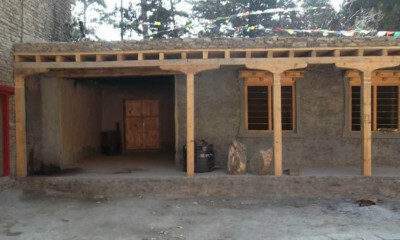 When the district provided development funding to the villagers, they decided to use some of it to rebuild the gompa’s eastern structure opposite the new kitchen block. 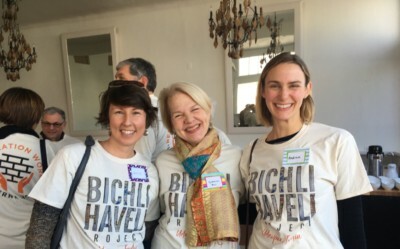 (Volunteers may remember the dilapidated structure that was there.) 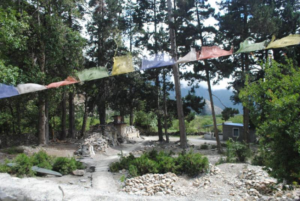 They also used some of the funding to replaster the front of the shrine rooms, laid a stone path between the gompa and the village, and built a small tea house and collection centre in support of the Local Governance and Community Development Programme. Meanwhile, the kitchen block second-story construction is continuing after a slight delay due to post-earthquake shortage of carpenters and, more recently, weather that has slowed work. The window and door frames have arrived and the work team will be installing the windows and beginning on the second-story walls and roof shortly. The kitchen block should be finished by early fall. The young monks continue their religious studies at the gompa and are attending the nearby school.